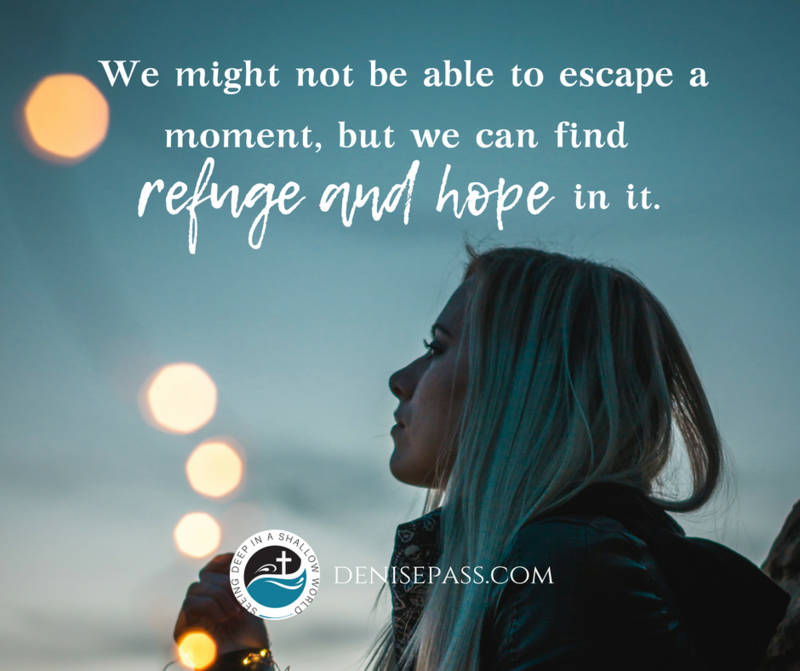 We might not be able to escape a moment, but we can find refuge and hope in it. Standing in the court numb and filled with anxiety, I suddenly became aware of my mind being distracted. The present moment was too much for me to bear, so I sought to find solace in anything that would take me away from the burden that enveloped me. Somehow dazing off into nothingness comforted me and made the pain hurt a little less. I left my mind drift and stood there, motionless. Then the gavel pounded and jolted me into the present, plucking me from a moment of peace. I really was there – being questioned and accused falsely. It was then that the Holy Spirit reminded me that I could not escape this moment, but I could find refuge in it. Wrapping my mind around the character of God and His purposes being so much higher than mine lifted me out of the desperation and momentarily placed me in the palm of God’s hands. Somehow, God would use even this or my good and His glory. But how? I could not escape this moment, but I could find refuge in it. Suffering has a great potential. It can either draw us nearer to God or drive us far away from His presence. It is in the moment of pain that we have a crisis that occurs – God’s goodness is called into question and suddenly the pain is not about the one who inflicted it upon us anymore, but about a God who would let it all happen in the first place. How could such a God be good, we wonder? When we are at the crossroads of despair and hope, the only means by which we can choose hope is by the grace of God pointing us to God’s goodness right in the midst. Such a belief is radical and seems nonsensical. How could we delight in good while we are suffering? Because we are fallen, defining good is limited to what we experience. It is about us. Good = pleasure, or good = blessing. But God’s goodness is not based on our experiences, “good” or “bad”. His goodness is based solely on His righteousness. When we encounter various trials and sufferings in this life, we can choose to focus on those sufferings and blame God, but that will not eliminate our pain. But when we remember the goodness of our God, we have hope because of His character. His promises always come true. Our pain is temporary. God’s goodness is eternal, as are His plans for us, which are good. Perhaps it is logical to say that pain is bad. But when we examine the fruit of pain, perhaps our opinion changes. If a perfectly comfortable life is our goal, will we grow? If a pain-free life is our earnest desire, will that cause us to draw near to God? Is a life without suffering good, after all? God’s goodness is not defined by whether life seems good. We might not be able to escape a moment, but we can find refuge in it by remembering God is good. When hardship or sorrow visit us and cover us in shame, we can have refuge and hope even in shame or pain because God bestows favor and honor to His children. Period. No good thing does He withhold. No. Good. Thing. And this comes from the only One Who is truly good. Amen! Speaking of God restoring us and giving honor to His kids, this month, Shame Off You is being launched into the world. If you have ever felt buried in shame and without hope, there is still hope for you and God wants to remove your shame. Pre-buy Shame Off You now to receive some free resources to help you in the Shame Off You life! This hits so hard right now. Our community is in the middle of battling a raging fire (now over 17,000 acres and only 5% contained and they just cannot get a handle on it) and it is bringing up so much stress and anxiety–as we lived through this exact thing this same time last year in another fire that consumed 88,000 acres of our tiny community and evacuated the entire town. It is bringing sadness, anger, worry and loss of faith in some. Hope is so important, that we never lose that and remember God is ALWAYS working, even when it doesn’t feel like it. Thank you for this hope today! God is with you in the fire, in the water, through it all. Praying He contains the fires in Jesus’ mighty name. <3 Thank you for sharing, friend! I was just praying to God to bring more of His goodness into my life. Sometimes my heart gets heavy while I’m working. I stop and pray to God asking him to address my pain whether it is legitimate or not. I told him today how much I craved His love and grace, which I was not shown as a child. I do my best to trust in God during my heart heavy moments. I am waiting on God expecting him to lovingly heal my heart as I long for His gracious acts, expressions and gestures of love. Wow, Janet, thank you for sharing. God will meet you at that place of transparency and you are in the perfect place of waiting on Him! Praying for you this morning! Oh, I have struggled with God’s goodness. I never will forget they day my friend said “you don’t believe God is good.”. I gasped at first at the thought. But she was right. Then one night I came to the end of myself. I ended up in a hotel room so totally broken and alone. It was there that my faith came to a dead end. I had to turn one way or the other. Choose God or walk away from the faith I had always known. Oh how I’m so grateful for that horrible night.